Steven M. Cahn is Professor of Philosophy at The City University of New York Graduate Center. He is the author or editor of more than fifty books. Most recently, he authored Religion Within Reason (2017). 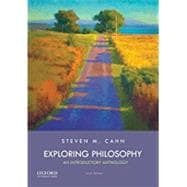 Dr. Cahn is the editor of Exploring Ethics (OUP, 2016) and The World of Philosophy (OUP, 2015). * The Confucian Way, Henry Rosemont, Jr.